Originally from Ashford in Kent, Sam Knowles first developed his love for art under the inspiring tuition of his school art teacher, painter Chris Daynes. Sam continued his art education graduating in Fine Art from Newcastle University in 2002, with his final year's work selected to be shown at The Globe Gallery, Newcastle, as one of the region's best emerging artists. Since graduating Sam has maintained his art practice while working in numerous and varied jobs which have included working as a college art technician, a vegetarian cook, a stationary salesman and postman. For the past 10 years he has worked as the painting and print curator in a commercial gallery in Newcastle. Sam is fascinated by wildlife and has worked as a volunteer for the Wildlife Trust and once spent three months in the Bieszczady region of Poland tracking wolves. The majority of Sam's work depicts and celebrates creatures in one way or another. 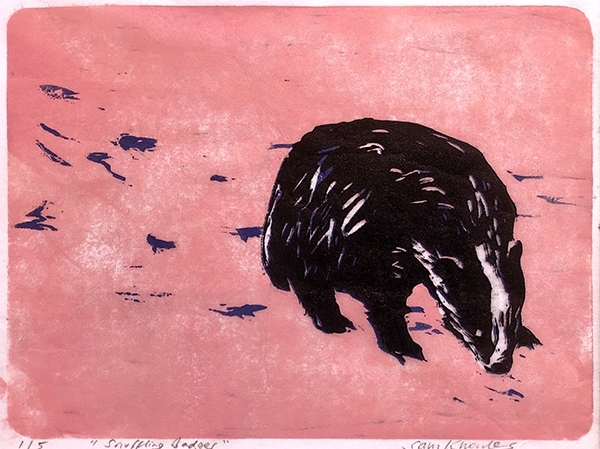 His work consists of linocuts of animals either real or part imagined. Using the process of reduction lino cutting, Sam produces works in very small editions, hand printed onto traditional Japanese printing paper. The resulting image is one that is handmade and crafted but ultimately graphic in impression.